Ron Hatchell is back tonight with another terrific monkey review. Actually, it's an ape - from Beneath the Planet of the Apes. This is the Sideshow exclusive version of Ursus, limited to just 500. Tell us all about the General, Ron! 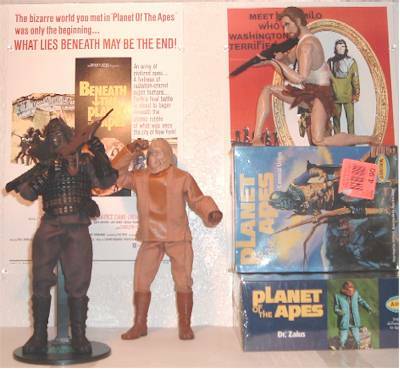 I was excited when Sideshow announced the first of their “Beneath the Planet of the Apes” line (based on the 1970 film) in February. I pre-ordered each one as it was available and have been waiting with a very controlled excitement for their arrival since then. 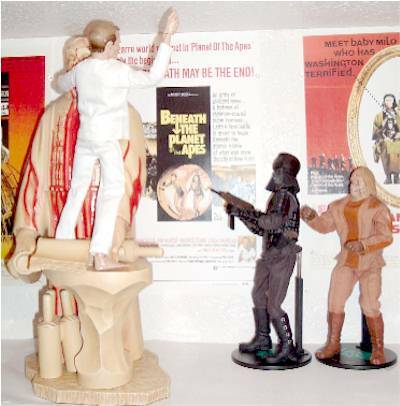 I received the Beneath version of Taylor, the astronaut version of Brent, the slave version of Brent around mid-July, and in early August I received General Ursus and the San Diego Comic Con Exclusive Vision Lawgiver Statue (100 made). That leaves the two mutants (the leader and the jailer) to complete the announced “Beneath” line. 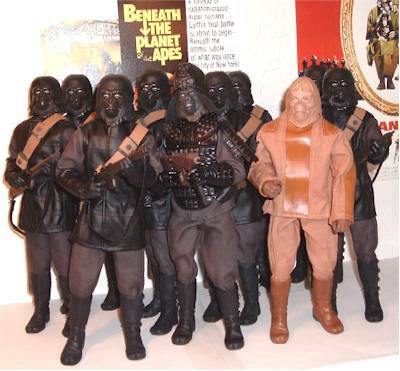 It is my understanding that if we want the Planet of the Apes line to continue, we need to e-mail Sideshow and let know. Sideshow has acquired licenses for all five “Planet of the Apes” movies and the TV series, but will be deciding which characters to make based upon what they feel is enough demand from the buyers. Sideshow handles requests for future wants through their regular customer service forum. So, please, let them know which characters you want by visiting their website and selecting the CONTACT US link on the lower left side of the page. Then select the [Customer Service Form] link, which is also used for “General inquiries”. And then select the “Other” option. They regularly tally results for these requests and pass them on to the correct department. The “Beneath” line uses an over-all color that seems to match the same movie in the 5-DVD box set (teal?). Each box released so far has on the front cover the logo, images from the movie, the “alpha-omega” bomb, and an actual image of that particular figure. The image of the figure’s head is also on the top and both sides. The back of the box tells General Ursus's story from the movie. The inside flap shows five scenes from the movie and some written text that tells a general story of the movie. The main differences between the boxes are the images of the actual figure that is in the box, their name, and the story of that particular character on the inside of the front flap. The figure is held in place in the plastic mold with one regular tie around the waist, three see-through plastic strips (similar to the “dental floss ties”, but thicker) around the neck and lower arms, and one standard thick plastic bands that supports the legs. One “dental floss” tie supports the ape pistol and one another one helps keep the sub-machine gun in the plastic. 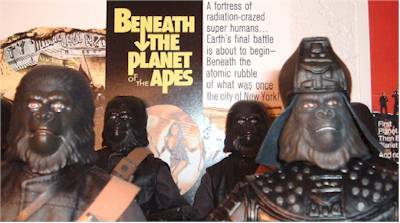 One standard tie helps keep the “Beneath the Planet of the Apes” stand in place. It must be tough for Sideshow to try to please everyone, but they keep trying. The new see-through ties are a bit tougher to untie than the normal thick ones. However, if you just want to display them and cut through the thin ones, you can get remove everything in record time. 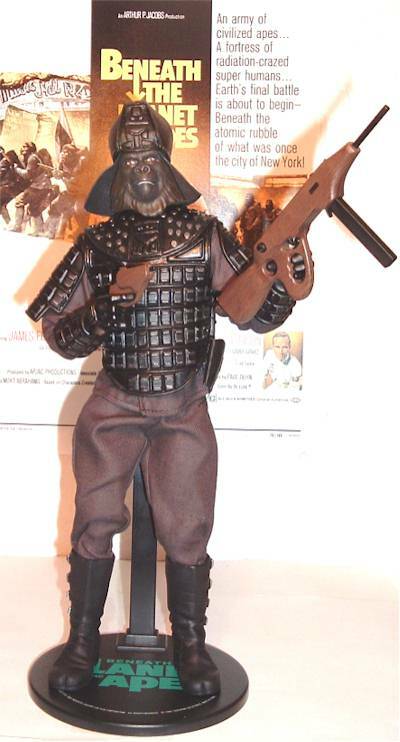 The artist for this James Gregory / General Ursus figure is Brian Dooley, who has been sculpting with Sideshow since June of 2003 and has sculpted a large number of the "Modern Horror Classics" and some of the Buffy characters, plus the super-outstanding Invisible Man. His face is very similar to the gorilla soldier, but different enough to tell the difference and set him apart from his soldiers. There are a decent amount of lines around his eyes, nose, and mouth. The opening of the mouth is wide enough to maybe even get a cigarette in there, if he had one and he smoked. Like the gorillas' hair, this is a soft sculpt, with lack of detail and definition, which hurts the rating in this category. The gloved hands have a bit of flexibility in the fingers and thumbs, allowing them to get and maintain a decent grip on his two guns. His fingers won't go around the ape pistol trigger properly, as they are too large (or the trigger guard is too small), but it can be placed behind the trigger or over the whole guard area, so it looks somewhat like he is gripping it correctly. I was able to have him get a better grip on his sub-machine gun when I used his left hand. I had to flex the fingers and thumb some, but his trigger finger managed to get in front of the trigger guard just fine, and the rest of the fingers/thumb in the proper places in the rest of the sub-machine gun. Doing this with the right hand was not as successful, but still close enough to look good for some poses. The face looks to be painted with a light black matte finish, with what appears to be a slight bit of white or gray that helps lessen the darkness on his face. The hair looks somewhat brown, with black used for separation. The overall face/hair paint is a matte finish, and lacks the shine of his face in the movie. I am dropping a half point for this. His eyes look outstanding, with a bloodshot look in the whites, and very carefully painted iris, and cornea. The paint on the two guns is very good, giving it that wood-grain look. The silver used on the buckles for the boots shows some bleeding. With over 30 points of articulation, his head can turn completely around and move a bit up and down, depending upon how high you extend his neck. There is a full, realistic range of motion in the shoulders, upper arms, elbows, forearms, hips, top of his thighs, knees, lower legs, and ankles. All the joints were very tight. Like some of the other apes necks/heads designs, I was able to raise his head from his shoulder, exposing the underside of his head so we can see where the two parts connect. This is much easier to do with the General, as I was able to lift his head up much higher than the other apes. I am not sure for the reason for this design, but I am curious. Due to the nature of the hair preventing some movement, maybe this helps by raising the head some. Anyway, it works. I am assuming that the wrists, waist, and shoulders also articulate as the rest of the apes, but are limited in movement by the gauntlets, cuirass, and shoulder pauldrons. His outfit looks very much like the one in the movie, which the General wore the entire time except when he was in the steam room/sauna with Dr. Zaius. His cuirass (front and back armor plates) are draped over his shoulders and stitched together at the sides through holes in the plates, and are made of some thick but flexible rubbery type material. His shoulder pauldrons (upper arm armor plates) are sewed onto this shirt at the bottoms, and then stitched into his shoulder plates at the tops. These, along with his gauntlets (gloves), are made of thick non-flexible plastic. The stitches are quite thick and unlikely to break, which is very good as they are bound to be pulled on quite a bit while moving his body around. The boot sculpts are excellent, and they are made from a soft rubber. They can be pulled from his feet quite easily. His belt is made of the same thin, leather-type material used on many of Sideshow's figures' belts. Although mostly hidden by his armor plates, it looks really good, with a pretty decent cutting job and plenty of excess belt after it loops through the buckle. The belt runs through the holster, which is made of the same material. The top part is made of a very hard material, and in the movie it was covered with a softer material that worked its way down to his shoulders. With the figure's version, the softer material seems to come from underneath the top hard part, and doesn't quite reach his shoulders. Looking at the back of his helmet, I was amused to see the similarity between how much it resembles the back of Darth Vader's helmet. I am dropping a half-point because of the length of the helmet's material that doesn’t quite make it to his shoulders. Otherwise this was an outstanding job all the way around, up and down. 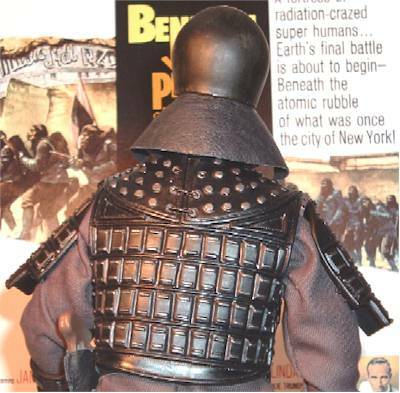 There are three accessories than come with this figure, including the “Beneath the Planet of the Apes” stand. 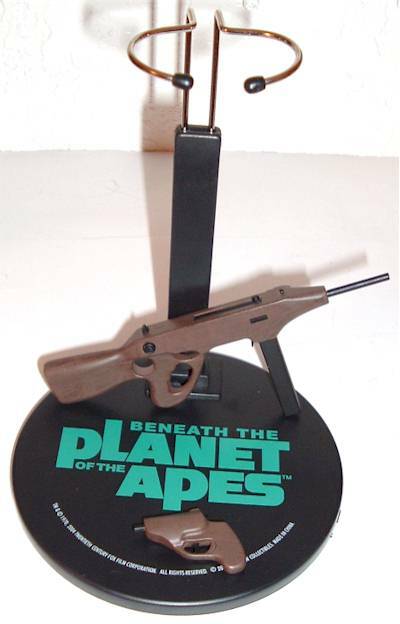 The ape pistol (with holster) is made of plastic. I am not sure if it looks like the movie version, as I didn't see it in the movie. 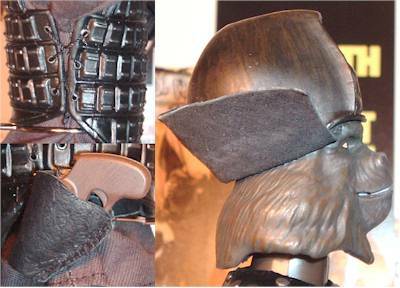 The holster looks excellent (taking into consideration that apes made them in the film version). It has a very leathery look and is stitched on one side. Instead of having a cut in the backside for the belt to run through, Sideshow went the extra mile and took an extra piece of "belt" and created a loop and attached it to the backside of the holster, and the belt runs through that. There is plenty of room in the "loop" for the holster to have room to adjust up and down. The "EXCLUSIVE ACCESSORY" sub-machine gun looks identical to the film version. 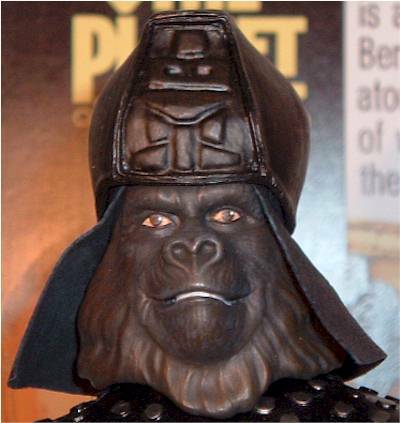 It has that "carved-from-a-piece-of-wood" look that the ape guns have and it comes with a detachable ammo clip. This is the gun the General used on Taylor. Well, I was very excited that we got a General Ursus, and Sideshow made us a version that looks as lean and mean as the movie's version. I've got over fifteen gorillas that needed a leader, and I certainly enjoying having this warmonger as the baddest of all of the Planet of the Apes characters. I did a custom of him as a child, using the rounded part of an egg carton that holds one egg as the top of his helmet, covered with blue jean material, and play-doh sculpted over one of my G.I. Joe's face, dried and painted. He was one of my favorite characters then, even though he wasn't in the film much, mainly because of just how cool and mean he looked. I've actually been looking forward to him more than the rest of the "Beneath" cast, and am having a good time posing him. Sideshow is selling this for $45.00 with a limited edition run of 500. The overall sculpt, uniform, accessories, and limited run helps make this an excellent value for the price. I would have been content paying $50.00. The only things I can think of to be careful for is not to pull too much or too tight on the body armor, in case the threads come loose from the shirt or the armor plates. And the sub-machine gun’s clip can drop off from the gun. These are not errors, faults, or anything negative. The threads are thick and hopefully able to withstand some tugging, but I certainly would not want to find out the hard way and then have to re-stitch any of it. It is good that the clips can be removed, but just make sure you are aware if it so you will know if falls and where it falls. 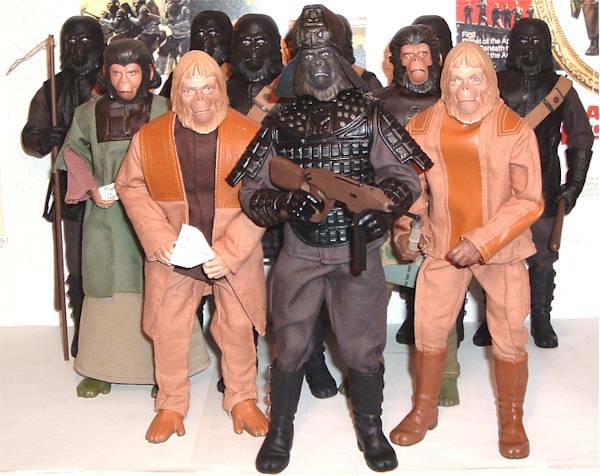 Excellent in every way, and very much needed in the Planet of the Apes line. Even with some of the same issues as most of the other apes, it is still an awesome looking creation and a great example of what sets Sideshow apart from almost all of their 12” action figure making peers. According to the imdb.com, James passed away in September of 2002 from natural causes. He acted in many T.V. shows from 1951 to 1987. The one I remember most was his character Police Inspector Frank Luger from Barney Miller. He was also in more than 50 films from 1948 to 1983. I bought this "Sideshow Exclusive" through Sideshow for $45.00, and the website still shows this as available for the US, Non-Europe, EUR countries. 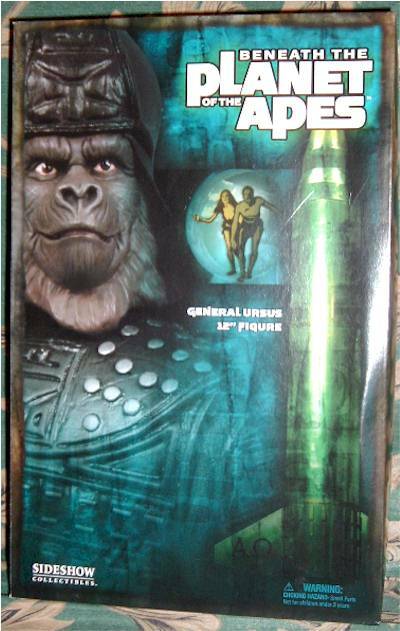 The also have the regular General Ursus available as well.